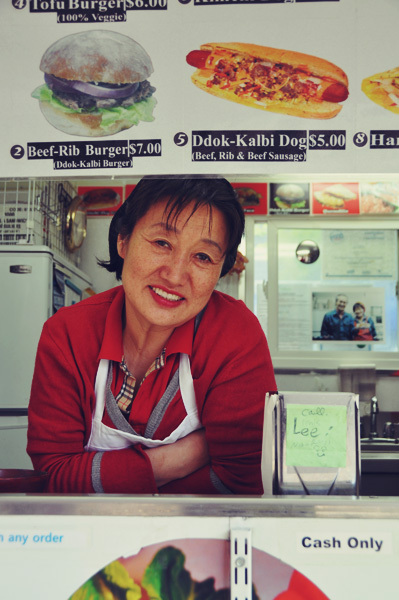 When Yong Sook Lee’s dream of opening a restaurant fell through, she was presented with an alternative: a food cart! Situated just outside the Central Library at the corner of Georgia and Homer, Ursu Korean BBQ Taco has been open for almost a year after temporarily moving from its original location at Georgia and Richards two months ago. It’s open daily from 11 am to 8 pm. Ursu Korean BBQ Taco is Korean cuisine with the convenience of a taco, lovingly constructed by Lee. But getting there was a family affair. 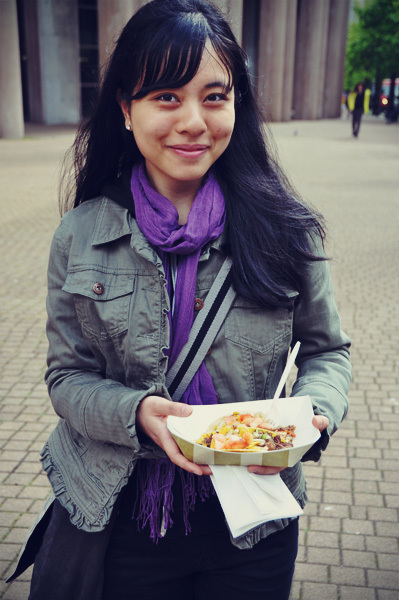 With input from her husband and two daughters, Lee created the menu which she describes as “all Korean.” Since Korean food was difficult to eat on the streets due to the number of utensils involved, tortilla shells and hot dog and hamburger buns provided the perfect solution as an edible base for Korean fillings. 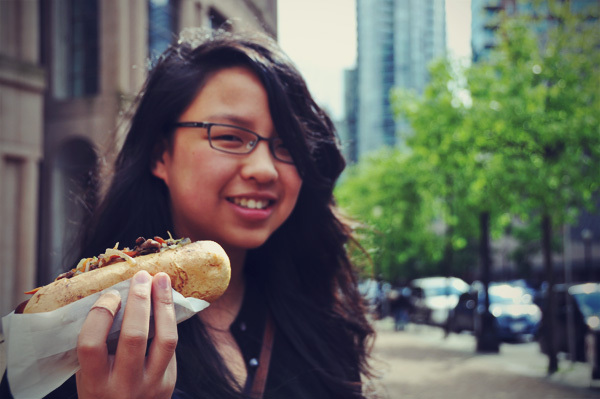 Beckie got the Ddok-Kalbi Dog (aka the D-dog) for $5, which was essentially a Korean version of a Japadog. It consisted of a beef sausage topped with hand cut rib meat and sautéed vegetables dressed with a spicy mayo, all wrapped up in a hot dog bun which Lee picked up fresh from a French bakery that morning. Stephanie ordered a soft shelled taco with chicken and a hard shelled taco with beef for $3.50 each, both topped with kimchi, diced tomatoes and onions, and shredded lettuce and cheese. The food was delicious and surprisingly filling. As we indulged in a little slice of her homeland, Lee told us about her children, her life in Korea, her love of Korean cooking, and her dislike of aging. She was incredibly sweet and friendly, and even offered us a drink for free as we chatted. 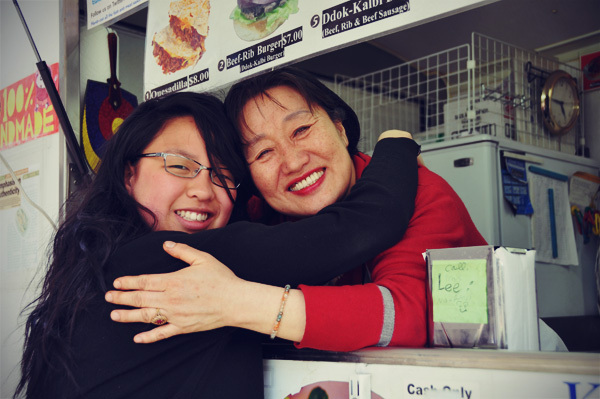 Ursu Korean BBQ Taco is the realization of Lee’s dream through hard work and continues to run with the support from her family. If you’re in downtown and looking for something new to eat, we recommend that you try Ursu Korean BBQ Taco because it’s fresh, innovative, and fantastic. 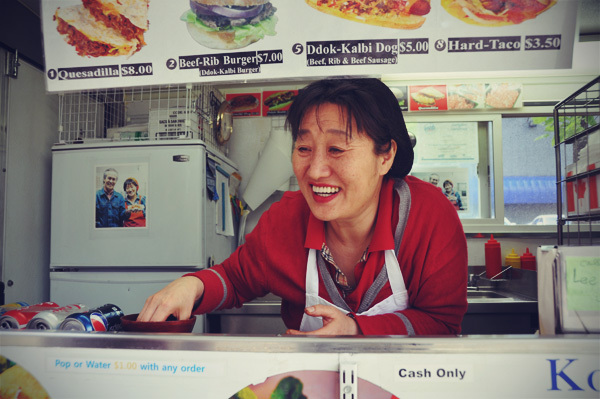 But the real reason you should give this food cart a visit? To get good food from an adorable lady. As we left that day with our stomachs full and our minds nourished, we started wondering: what is the relationship between what we eat and how we live? 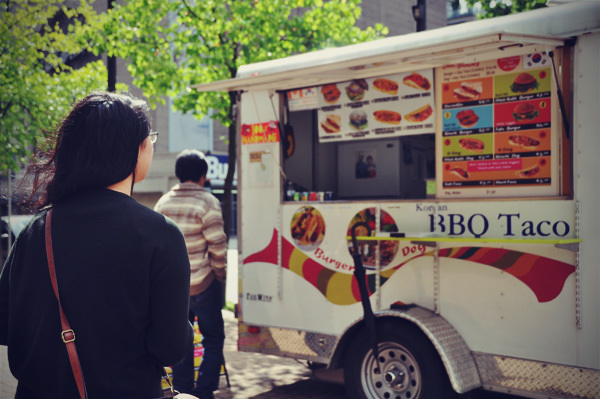 Are food carts revolutionizing more than just the way we eat today? Traditionally, food has been seen as an ethnic marker, a way of defining who we are. 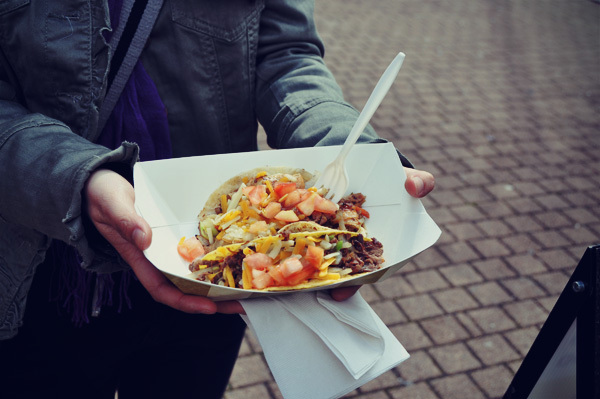 With the rise of street food in an increasingly globalized world, how are fusion foods crossing cultural boundaries and changing the way we understand the concept of identity? What are your thoughts? We’d like to know. – Beckie and Stephanie, street food enthusiasts, random conversationalists, and RP Interns.